Part 1 Types of smart medical textile: Trends in smart medical textiles; Smart woundcare materials; Textile-based drug release systems; Application of phase-change and shape-memory materials in medical textiles; The use of electronics in medical textiles; Textile sensors for health care; Smart dyes for medical and other textiles. Part 2 Smart medical textiles for particular types of patient: Intelligent garments for prehospital emergency care; Smart medical textiles for monitoring pregnancy; Smart textiles for monitoring children in hospital; Wearable textiles for rehabilitation of disabled patients; Wearable assistants for mobile health monitoring; Smart medical textiles for monitoring patients with heart conditions. Smart or intelligent textiles are a relatively novel area of research within the textile industry with enormous potential within the healthcare industry. This book provides a unique insight into recent developments in how smart textiles are being used in the medical field. The first part of the book assesses trends in smart medical textiles. Chapters cover topics such as wound care materials, drug-based release systems and electronic sensors for health care. 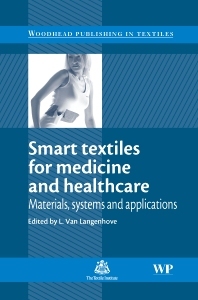 The second part of the book discusses the role of smart textile in monitoring the health of particular groups such as pregnant women, children, the elderly and those with particular physical disabilities. With its distinguished editor and team of international contributors, this book provides a unique and essential reference to those concerned with intelligent textiles in healthcare. Dr Lieva Van Langenhove is Professor of Textiles at the University of Gent, and is internationally acclaimed for her research on smart textiles, in particular for applications relating to comfort and the health sector.